The new Windows 8 Consumer Preview is out, but is it ready for seamless virtualization with other operating systems? With the release of the new Windows 8 Consumer Preview, we're seeing a lot of commentary--good and bad--on Microsoft's next major revision of its operating system. 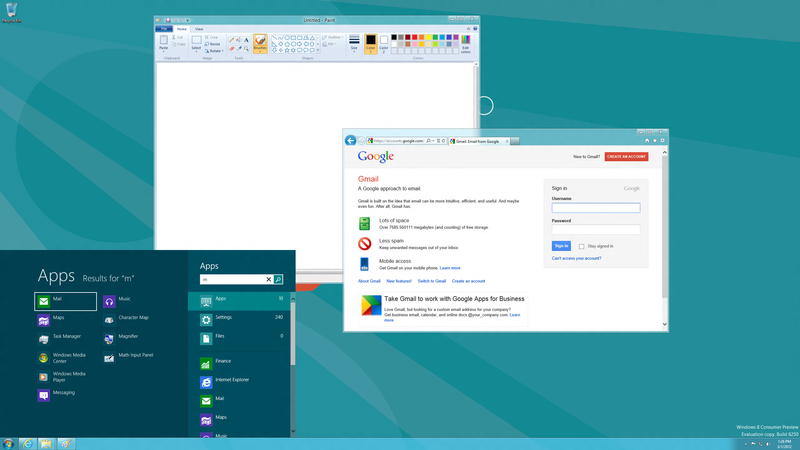 One of the major bones of contention with Windows 8 is the implementation of the Metro Start screen as the default interface. I'll delve more into the pros and cons later, but the Metro interface doesn't lend itself to seamless integration with OS X in a virtualized setting. There are ways around this, however. When I first attempted to install Windows 8 under Parallels, the mouse wasn't working properly, and Coherence (seamless mode) wasn't functioning. I then installed VirtualBox which had just been updated to handle the new Windows 8 preview. Installation was painless. However, seamless mode was not functioning. When trying to switch to seamless mode, it simply removed the border around the VM window and changed nothing else. Otherwise everything else functioned properly. Since the start menu is an issue, there are several ways around this. One is through the use of the free app from Stardock called Start8. This seems to compress the Win8 Start screen into a stylized Start menu. However, it doesn't function the same, so if you're looking for the classic Start menu you need to look elsewhere. Look no further than ViStart from LeeSoft. This little app actually brings back the classic start menu from Windows 7, and seems to cooperate well with Windows 8. The only bug I've seen so far is that it triggers and error when you reboot the Windows 8 VM. A minor issue, and hopefully one the developer will soon fix. Shortly after I started testing, the makers of Parallels released an update to fully support Windows 8, and even provided a direct download for the consumer preview directly within the application itself. The fixing of the mouse compatibility was welcome, but what I didn't expect was that they had fixed the seamless mode. While the full-screen apps for Metro don't work well in this mode, all of your regular windowed applications should appear in seamless mode just fine. Also, with the use of VIStart, you even get the seamless Windows Start menu. I personally do not use VMWare Fusion on my MacBook Air, so I can't verify that it works properly with Windows 8 in a similar manner to Parallels. I have not seen any updates from VMWare yet to support Windows 8 functionality, although it's likely that it will be forthcoming shortly. If anyone has any more information about it, I've love to hear it. Finally, a bit of a personal rant. To be honest, I think Microsoft is making a huge mistake by defaulting to the Metro interface on desktop systems. It's not intuitive to the average user, and it's a major shift from the way things are done now on standard desktop systems. Video courtesy of Chris Pirillo and LockerGnome.